Besides the fact that the air temperature has dropped 15 to 20 degrees, this is a great time of year to fish the South Shore. The cold fronts have started to arrive, along with the winter tides and a decrease in water temperature. The snook and redfish have moved into their backwater haunts. It’s a great time to hook up with a big snook in the river or in the backcountry. It’s a good idea to power up on your line weight and on your leader weight, as the “big girls” will want to run straight into the mangroves causing all kinds of trouble. Last week we caught many nice snook (18 inches to 26 inches), and reds, too. Snook and redfish are closed, but are still fun to catch and release. Trout are starting to stack up, and daily limits are fairly easy to catch along with plenty of gator trout. Each angler can keep four trout with only one measuring over 20 inches. 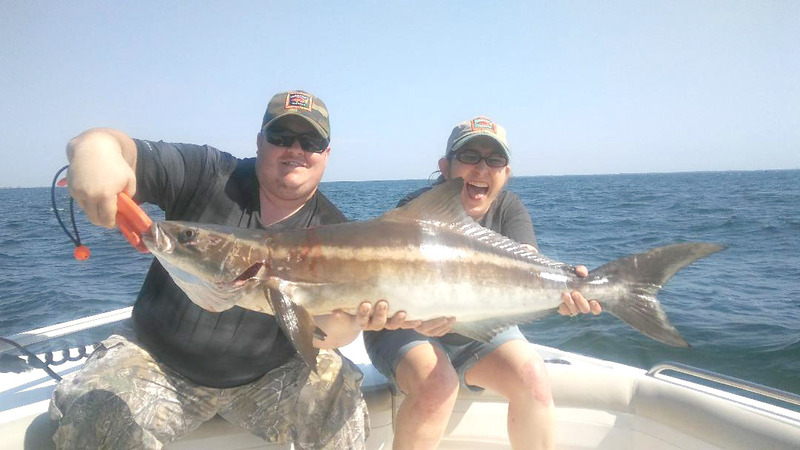 The flats are coming alive with cobia, pompano and flounder. All are being caught with regularity. The winter tides combined with low tides can create some special issues, so be familiar with the waters and tides and play it safe. One of my Captain buddies always says, “You ain’t been around, if you ain’t been aground,” but I think we’d all like to avoid that situation if possible. Out in the bay, grouper, mackerel, bluefish, sea bass, porgies and some sheepsheads are biting. Finding structure is the key to success. Live bait has been fairly easy to chum up and cast net on the flats over the last month, but was scarcer on the flats the past few days. On the other hand, some towers in the bay were loaded and “one and done” is always fun. As we proceed into winter fishing, shrimp will take over as the go-to live bait. A nice, big cobia catch. Our team, “Gettinfishywithit,” won first place in the Reel Ladies Fishing Tournament, presented by Captain Lori Deaton of Ladyfish Charters. It was a species event that featured all-female fishing teams. The weather wasn’t great (a wee bit windy), and the bite was fairly tough, but the team managed to catch nine different species of fish to win first place and the $500 first-place prize. Along with snook and trout, the team managed to catch some jack crevalle, mangrove snapper, gag and red grouper, bonnethead shark, ladyfish, Spanish mackerel and flounder — a great day on the water showcasing our lady anglers and our fisheries’ diversity. 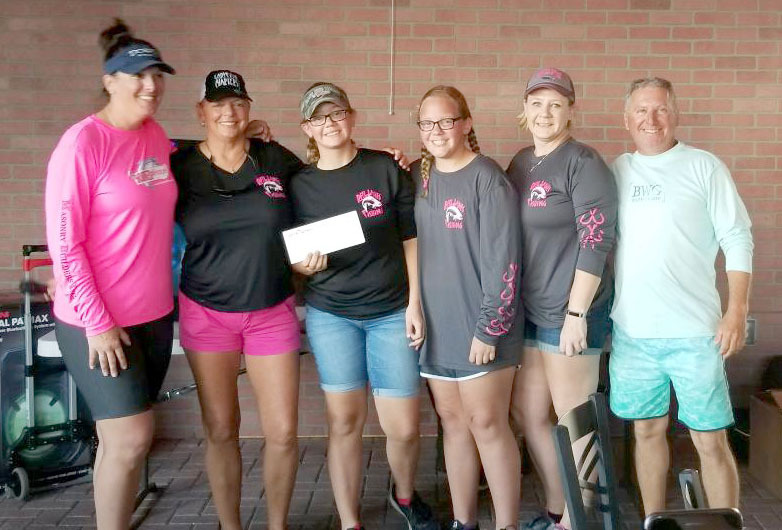 The “Gettinfishywithit” team took first place and the $500 cash prize at the Reel Ladies Fishing Tournament. Hoping everyone had a great Thanksgiving and start to the holiday season. I’d like to give a shout-out and thanks to my sponsors and supporters. Shop small when you can and support our local companies. Many thanks to Antigua Cove at Little Harbor Marina; Hooks Waterfront Bar and Grill; Alafia Marine; First Fish; Florida Fishing Products; Lee Fisher International; Clenzoil; Yamaha; Power Pole; and Bait and Tackle of Apollo Beach. If you’re looking for a great day on the water, give me a call and I’ll be happy to show you how much fun our fishery can be. Hope to see you on the water. Tight lines.